I think that I've finally locked down the menu for Thanksgiving and I'm feeling pretty good about it. I know it will meet my goal of traditional with a twist. Our family Thanksgiving isn't until Saturday, so I will still be cooking and preparing long after most of you are relaxing in your food comas or holiday shopping. To keep it low stress, I took a cue from Ina Garten and am doing simple appetizers and as many things that I can prep in advance. Also, my brother in law is preparing about half of the side dishes to go with the main course and my mother in law is bringing desserts. If you are still undecided on what to make, I hope you get some inspiration from my menu. Thanksgiving 2010 "The Middle Menu"
One thing I learned about planning this Thanksgiving menu is that you have to consider what your time-line will look like the day of. For example, the Buckeyes are playing on Saturday and then men want to watch. I adjusted my cooking schedule so that we could eat our main course around half time. Also, I went through my recipes to figure out what I could make in advance. The cranberry relish can be prepared several days in advance and refrigerated; the cheddar dill scones can be made and then frozen until you are ready to bake them. I'm making the candied pecans tonight or tomorrow and then keeping them in an airtight container on the counter until Saturday. I'm sure I will be wrapped up in Thanksgiving preparations and holiday shopping for the rest of the week, so until next week, I wish you a wonderful weekend filled with food and family. I would like to withdraw my declaration of dislike for fennel. In fact, while I will likely continue to spit out black licorice jelly beans every single time I mistake one for a chocolate pudding flavor, I think that fennel might become one of my new favorite winter vegetables. This is shocking for me, but I admit that what I presumed fennel would taste like, and what it actually tasted like when cooked with lemon zest, onions, parsley, and other flavors was not what I expected. I'm still on a mission to create a middle menu for Thanksgiving. 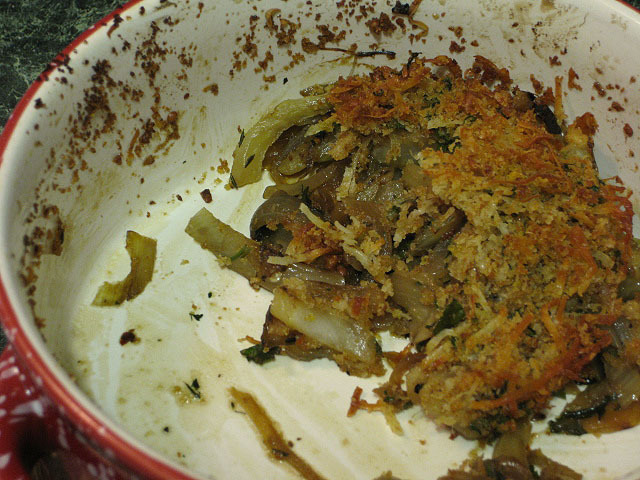 When I found a recipe for Fennel Gratin, I considered the possibilities: I could hate the mere smell of it baking and dump the whole thing out before we ate it or I could go ahead and try it out, even serve it to Tim, and if we both liked it then it might be a contender. As I was slicing the fennel bulbs, I tried to decide how I liked the smell. I didn't hate it and the sheer excitement of finding out that I might actually like it made me a little giddy. 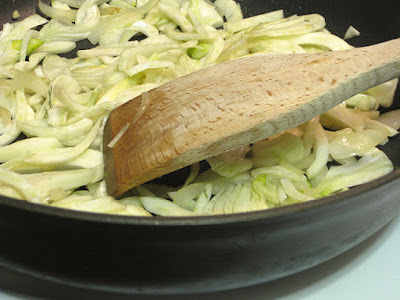 While I was sauteing the slices of fennel with onion and garlic, Tim wandered into the kitchen with his nose tipped up in the air. And when I popped the finished product out of the oven, I completely forgot to snap a picture because we couldn't wait to taste it. Honestly--we loved it. I feel a little silly now about years of insulting and ignoring fennel when the plant hardly deserved it. I called my mom a few days later and my Fennel Gratin came up in conversation. "We loved it," I told her, "but I thought that I hated that fennel flavor." And my mother, in all of her motherly wisdom, said, "I thought you did, too, but our tastes change as we get older." I don't think this will be going on my Thanksgiving menu, because I suspect that the young kids (and perhaps some of the older ones) might still have an aversion to fennel. I think this dish will be my little (not-so) secret recipe, saved for a more adventurous dinner crowd. Fennel, my new friend, I hope we meet again soon. Preheat oven to 425 degrees F. In a large, wide pot, heat olive oil over medium heat. Add onion and garlic, saute until soft but not brown, about 5 minutes. Increase heat to medium-high and add fennel. Saute until fennel is slightly softened and starting to brown, stirring often, about 15 minutes. Stir in broth, parsley, thyme, and red pepper flakes. Season to your taste (recommended is 1/2 tsp kosher salt and 1/4 tsp black pepper). Reduce heat to medium-low and simmer about 5 minutes until broth is mostly absorbed. Transfer to an oiled baking dish. Melt butter in a medium skillet over medium heat. Add breadcrumbs and saute until golden brown, about 3 minutes. Remove from heat and cool to room temperature. In a small bowl, mix breadcrumbs, parsley, Parmesan cheese, and lemon zest. Sprinkle crumb topping over fennel. Bake until heated through and topping is slightly browned, about 20 minutes. Serve warm. Since we are first time Thanksgiving hosts, I want to test new recipes before the big day to make sure they meet my expectations. I've been searching high (online) and low (magazines & cookbooks) for anything that seems like it fits my vision. I found a dessert recipe to test when I was looking through my latest Bon Appetit magazine (Thanksgiving issue). It was a recipe for Pumpkin Cheesecake. I wouldn't call myself a cheesecake person. Do I like cheesecake? Sure, it's fine. But out of a dessert line up, I would almost never choose it. I'm more of a chocolate person. There was just something about the simplicity of this recipe--likely combined with my my new found love of pumpkin--that made me instantly tear it out of the magazine so I could round up the ingredients. Cheesecake makes me think of my dad--a lover of cheesecake and unexpected baker. Before the Cheesecake Factory was in this area, he sought one out while we were on vacation. We ordered a few light appetizers, saving our appetites for dessert. We chose the flavors of cheesecake we wanted to try; we ended up creating a small assortment of desserts to sample. 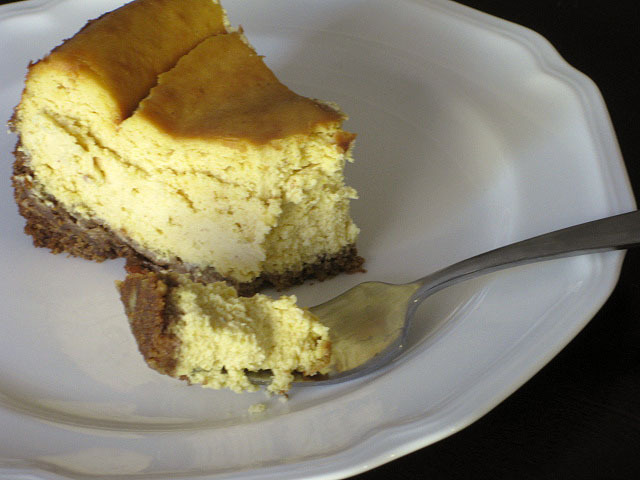 I remember when the thick slices of perfectly baked cheesecake came out to our table, my mom's eyes grew wide at their height and decadence. We are a family who appreciate food for it's flavor and presentation so at the time these cheesecakes were extremely impressive. Most people wouldn't really expect my dad to be someone who bakes, but he does, mostly around the holidays. When I brought my Pumpkin Cheesecake to their house this past Sunday, my father quietly inspected it and said, "That looks great, Jen." And when I expressed my concern about how high the center had rose in the middle while baking and then sank down and slightly cracked when cooling, he said, "They do that--they rise up and then the center falls. It looks great." It wasn't the perfectly proportioned cheesecake like we ate at the Cheesecake Factory--but I had my father's seal of approval, and it was better than any cheesecake I'd ever eaten. My husband told me that he thinks we could have reduced the amount of "sinkage" of the middle by cooling down the cheesecake more slowly. I did a little research about that and decided to trust Ina's recommendation. In a recipe for a chocolate cheesecake, she baked it for 1 hour and then turned the oven off and let the cheesecake sit in the oven with the door slightly open for 1.5 hours. If you have that kind of time, then I would definitely try that method and see how it goes. Ina is rarely wrong! Spray a 9 inch springform pan with non-stick spray and line the bottom with parchment paper. Add ginger snaps, pecans, and melted butter to a food processor. Pulse until ingredients are in small crumbs but will slightly hold together when pinched with your fingers. 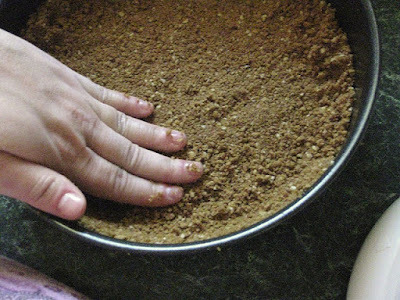 Dump out the mixture into the pan and with your fingertips press onto the bottom and up 1 inch of the side. (See picture above) When you are finished, refrigerate while making the filling. Preheat oven to 325 degrees F. Beat cream cheese and sugar on medium with a mixer until well blended. Add pumpkin, spices, and vanilla and mix well. Add eggs, 1 at a time, mixing after each. Pour mixture into crust. Bake 80 minutes to 90 minutes or until the center is almost set (it may still slightly jiggle). Remove from oven and run a knife around the edge to loosen from the side of the pan. Cool before removing the rim. Last weekend, Tim and I went to Findlay Market. As we were waiting for our made to order breakfast from Helen's Grill, we started talking about Thanksgiving. We chatted about what our plans were, what houses we were going to be visiting, and what we were supposed to bring. As if he were struck with brilliance, Tim suddenly suggested, "How about we have Thanksgiving at our house?" And, in other great coincidences (or not coincidences), right next to Helen's Grill is Luken's Fish, Poultry, and Seafood, who had one beautiful turkey left in the display case. We had purchased some excellent scallops from Luken's a few weeks prior and have heard great reviews about the quality of their products. So after we finished eating, we walked out of Findlay market with, among many other things, a turkey. Since then, I have been brainstorming with the Dayton branch of Tim's family about the menu. We've gotten as far as Tim vetoing roasted brussel sprouts, Tim's brother offering to bring all starches, and I know I can count on Tim's mom to bring some amazing Amish bread. That leaves me (and Tim...but mostly me) to prepare the vegetables, appetizers, and desserts. There will be just 8 of us, including 1 teenage vegetarian and 2 littler kids, which means the choices need to be sophisticated but still approachable. I want to make sure no one feels like our interpretation of Thanksgiving is too far from what is expected from Thanksgiving. It's sort of a fine line between traditional and unconventional. I want to find the middle ground--or more precisely, the middle menu. I started a new position at work this week. In celebration of my final commute to Oxford I decided to indulge in one of the college town's most famous restaurants. 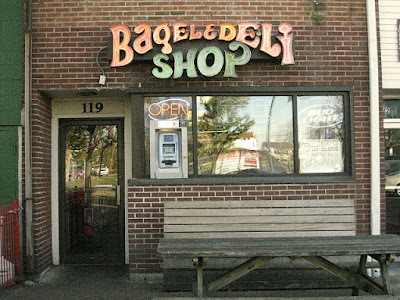 In fact, picking up a farewell sandwich was my friend Lia's idea, who as I told you before, encouraged us during Alumni Weekend to go not just once but twice to Bagel and Deli for late night food. 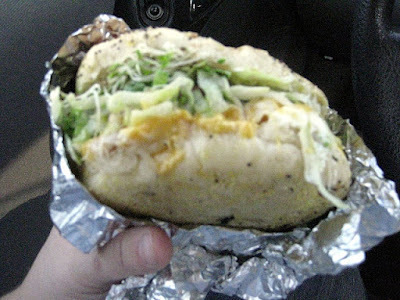 So I went to Bagel and Deli mid-afternoon, when the store was empty and only one bagel-maker was working, and I ordered my favorite sandwich--The Messy Katie. If you're unfamiliar with Bagel and Deli, the name of the sandwich may sound strange. Who is this Katie and why was she so messy? 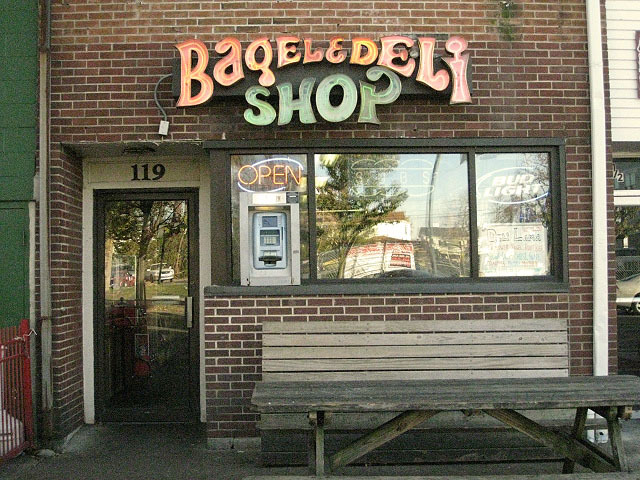 But that's the thing about Bagel and Deli--all of the sandwiches are named for favorite combinations of past employees, famous (and infamous) visitors to Oxford, as well as past and present Miami students, who have left their legacy on the town and this little shop. Man, that Messy Katie was so, so good. Ohio sunshine in November is deceiving. You expect to walk out into it and be blanketed in its warmth and have your face flushed with its toasty rays. But you are always surprised when it's not warm, and even the splashes of sun can't cut through the windy chill. A light sweater doesn't provide enough barrier to block the chill from hitting your skin, and you realize that you must wear a jacket or more layers to keep yourself warm. For me, it's always hard adjusting to the falling temperatures. We experience such distinct seasons in Ohio that I am just getting used to summer when fall starts pushing the warm weather out. There is never enough time to truly get comfortable with one season before you have to swap out your dresser drawers for a more weather-appropriate wardrobe. I try to ignore the changing weather for a while. This morning I decided to leave my warmer sweater in the car and walk the half block to my office without it. It wasn't so bad the first 30 feet or so, and then I found myself in a self-hug position, trying to shield my self from the cold air with my arms. Tomorrow, if the cold temperature remains, the sweater is coming with me! Heating myself up from the inside out is really the only solution I can reasonably come up with for coping with the cold. Hot tea becomes my new best friend, replacing her iced cousin. The amount of hot tea that I've imbibed during just the few short weeks of cold temperatures is enough for most people to be worried about staining their teeth. However, I have been blessed with perpetual white teeth (thankfully) and drink my tea with reckless abandon. Tim has found his own way of staying warm. Spicy foods--and the spicier the better. A few days ago we ordered some Dewey's pizza, and before I even handed Tim his plate I went ahead and sprinkled his slices generously with red pepper flakes. I knew if I didn't he would do it himself. And it isn't uncommon for Tim to put red pepper flakes AND sriracha on his pizza simultaneously. I often wonder how his taste buds have fared with all of this intense spiciness but he assures me that they are all in good working order. This cold weather coping mechanism is not unfamiliar to me as my dad was known to eat hot wings so hot (how hot were they?) that he would wipe sweat from his brow between bites. So maybe it's a man-thing, or maybe it's just a men-in-my-life thing, or maybe a men-in-my-life-during-cold-weather thing, but no matter why, it has increased the spicy factor in our food as of late. If you are also a lover of warm, spicy, comforting foods, you should definitely try upping the spiciness of vegetarian chili, home-made stir-fry, and this incredibly easy Coconut Thai Curry (all of which I thought were plenty spicy as I've adapted, but Tim added extra sriracha to his for added heat). I was able to find coconut milk very easily in the international aisle or the "mixed drink" aisle of the grocery store. You can buy it in a 13.5 ounce can. Also, consider adding broccoli or carrots when you add the cauliflower and potato. Or toss in some peas or cashews when you add the chickpeas. The possibilities are endless with this curry. In a medium saucepan, heat oil over medium-high heat. Add onion and ground mustard and cook for about 3 minutes, stirring until onion is soft. Stir in rice. Add 1.5 cups water, season with salt & pepper, and bring to a boil. Cover and reduce to a simmer; cook until water is absorbed and rice is tender, about 15 minutes. Remove from heat and let stand 5 minutes. Fluff with fork before serving. At the same time as making the rice, in a Dutch oven or heavy pot, heat vegetable oil over medium-high heat. Add onion and cook, stirring until soft about 3 minutes. Add curry paste and stir until fragrant, about 1 minute. Stir in coconut milk, spicy chili garlic sauce, and 1 cup water and bring to a boil. Add sweet potato and cauliflower, season with salt & pepper, and reduce heat to medium. Cover and simmer until vegetables are tender, between 10 and 15 minutes. Stir chickpeas into curry and increase heat to high. Simmer rapidly until liquid reduces slightly, about 2 minutes. Serve curry over rice with cilantro.